The Voice's Battle Round continued and featured nine artists surviving the cut during Monday night's Season 16 broadcast on NBC. The artists who advanced by winning their respective Battles were Lisa Ramey, a 33-year-old from New York City, NY; Mari, a 20-year-old from Clermont, FL; Andrew Sevener, a 22-year-old from Alvarado, TX; Abby Kasch, a 20-year-old from Palos Park, IL; Jacob Maxwell, a 20-year-old from Coeur d'Alene, ID; Rebecca Howell, an 18-year-old from Cochran, GA; and Kalvin Jarvis, a 30-year-old from Tucson, AZ. The artists who lost their respective Battles but were stolen by other coaches in last night's episode were Betsy Ade, a 40-year-old from Kenosha, WI, and Jimmy Mowery, a 31-year-old from Altoona, PA. The first Battle of the night was on behalf of John's team and featured Lisa against Betsy. The women performed "The Joke" by Brandi Carlile for their Battle. Adam loved the song and the power of their emotional and raw vocals. He thought the duet brought out their similarities more than their differences. Blake said if he wanted to be "stupid and critical," Lisa has the type of voice that attacked the song but Betsy put so much feeling into all of her notes. Kelly noted the Battle was "a blessing" to watch two ladies perform so comfortably on the stage. Kelly said either woman would be deserving to win because they're both "incredibly insane" but Betsy had a tear in her voice that gave her the slightest edge. John admitted he was worried about this decision all day because both ladies belong on this show as well as a big stage. He loved their energy together but needed to make a decision. John therefore declared Lisa the winner of the Battle because she "electrified" him a little bit more with "the fire in her voice." She impressed him "a hair more." However, Kelly wasted no time in stealing Betsy, who blew her away. Adam's team was up next, and he matched Mari with Anthony Ortiz, a 20-year-old from Tampa, FL, for a Battle. The pair sang "I Like Me Better" by Lauv. Blake called it a high energy and fun performance. He appreciated Mari's stage presence but said Anthony has nearly perfected his vocal capabilities. Kelly said Anthony did a "great job" but Mari "killed it," and John agreed she had taken ownership of the song. After both Kelly and John admitted they were "leaning" towards Mari being the winner of the Battle, Adam acknowledged Anthony's nerves got the best of him a little bit but he recovered well. Adam found the Battle entertaining, but he named Mari the winner. He called her a powerful little "superstar." Blake's team was up next and he paired the following two artists together: Andrew and Hannah Kay, an 18-year-old from Magnolia, TX. Hannah and Andrew took the stage with "Tequila" by Dan + Shay. Blake said this Battle was a departure musically for Hannah and Andrew but they were forced to step up to the plate and be flexible. Blake acknowledged he hates this part of his job but he felt the need to name Andrew the winner of the Battle. The next Battle was for Kelly's team and featured Abby against Jackson Marlow, a 19-year-old from Rogersville, AL. Kelly asked the duo to sing "Bring On the Rain" by Tim McGraw. Kelly loved the richness in Jackson's voice, but she named Abby the winner because she was more "unbridled" and has a passion for music and a love for the stage. Jacob then took the stage for his Battle with Talon Cardon, an 18-year-old from Pleasant Grove, UT. The guys represented John's team and performed "Every Little Thing She Does Is Magic" by The Police. Adam said it looked like they had a lot of fun but Jacob appeared to be a little more in control. Blake agreed Jacob had a better grasp on the song overall, and the coaches noticed a little crack in Talon's voice. After Blake pointed out Jacob should win, Kelly complimented Talon on at least keeping up with his opponent. John was very proud of his team members and thought they had executed the performance with joy. 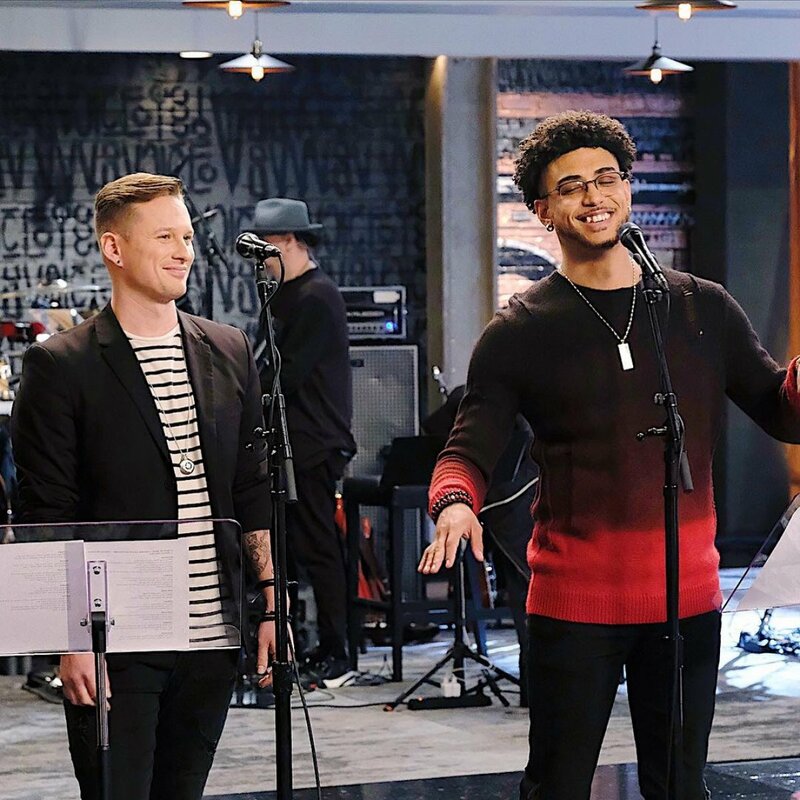 John said he liked listening to the top end of Talon's voice, but he ultimately agreed with his fellow coaches and chose to advance Jacob to the next round. Kelly then paired the following two artists together: Rebecca and David Owens, a 25-year-old from Indianapolis, IN. The pair were required to sing "Unchained Melody" by the Righteous Brothers. John thought they were a beautiful match and predicted the choice was going to be tough for Kelly because they both had different sounds and tones. He said it would be like comparing apples to oranges. Adam said David will continue to get better -- and he has "a unique and incredible voice" -- but the Battle clearly went to Rebecca. Blake, however, "strongly" disagreed with Adam, saying David brought a unique rattle to the table and would really benefit from a good coach on the show. Kelly thought both of her team members executed the song well and did an outstanding job, but she was impressed by the fact Rebecca "never screws up." Kelly ended up going with Rebecca because "she's a fighter" and showed more than she did in rehearsal. The last Battle of the night belonged to "Team Adam." Adam decided to pit Kalvin against Jimmy for a performance of "U Got It Bad" by Usher. Blake acknowledged the song was complicated because there was so much overlapping, and then Kelly noted they blended together nicely. Kelly was shocked by Jimmy's voice because she never expected such awesome runs, but she loved Kalvin's tone and felt this could have been his own song. John noticed great chemistry between the guys and said they expressed confidence and humility on the stage. John thought Adam's decision would come down to a person's range or lack thereof. Adam gushed about how he was "over the moon" with this pairing because they worked very hard and it translated into their performance. Adam ultimately decided Kalvin had won the Battle because he's always consistent and boasts a special tone. However, John opted to steal Jimmy because he "has the chops" to do well in this competition.